One of the things we really love about Real Scientists is that we, along with the community, get a feel for what it’s like to be in other fields of science, or to be someone who started out with a science degree and didn’t end up in research, or a clinician like Dr Yarwood who hosted last week, or someone who’s made the transition out of research into other work that’s still based in science. This week, we’re delighted to host Dr Hannah Thompson/@halften, an agricultural plant pathologist who hails from Tasmania. 1. How did you end up in science? I think I was always going to go into science. I loved science in primary school (I still remember dissecting cow eyeballs in grade 4), I took extra science in high school and my pre-tertiary subjects were all science with the exception of music. I’m definitely wired for that way of thinking, and I was very lucky to be surrounded by people who supported and encouraged me in my path. 2. What got you into agricultural plant pathology? I did my undergrad in Ag Science because it seemed like science with a purpose. I’d grown up in semi-rural Tasmania, my family was involved in agriculture, and it was the natural choice for me. Ag Science meant I could end up in anything really, from practical farming to business to the most complicated of molecular biology (am I selling the degree?). I hated animal science though, and loved microbiology. Micro labs are great fun – they involve fire, microscopes, dye, autoclaves, deadly bacteria… what more could you want? But microbiology in itself didn’t grab my desire for my work to have a practical aspect – I want to help to make sure people have enough to eat essentially. Plant pathology meant I got to play with bacteria, flame all the instruments I wanted, and make a difference for food production. It’s a fascinating area that involves so many things – biosecurity, epidemiology, evolution, plant/microorganism/chemical interactions, soil ecology, plant and microorganism genetics and more. That said I almost fell into the field. When I chose an honours project the plant pathology one stuck out as being the most interesting. I had great supervisors who took me on for a PhD in the same area. 3. What is it about plants that fascinate you? I don’t think I am necessarily fascinated by plants. I don’t see myself as one of those tv scientists who can real off facts about their topic with a one track mind. Of course I am interested in plants, particularly how they interact with their environment – with the soil and water and organisms around them – and how their genetics can affect their growth and these interactions so much, but primarily plants are a means to an end. Plants are our primary source of food and fibre, and science is a great tool that allows us to maximise our production of these while minimising harm on our environment and ensuring our food is sustainable. Improving plant production is also one of the best ways to improve the quality of life in developing countries. I was born in Hobart and have lived here my entire life. Though I do move in 2 months to take up a new job – pretty terrifying! I did my BAgrSc and PhD at UTAS. I don’t currently work in research, but in “alt ac” – alternative academia, supporting graduate research candidates and supervisors. My new job will be in agriculture, but in the policy side of things. I’m currently trying to deal with leaving research and using my science background to make a difference elsewhere. I won’t have any current experiments to share, but I am going to use the week to encourage me to finally submit that paper I’ve been meaning to finish – I may have left research but I haven’t really left research yet. Please welcome Hannah to Real Scientists! 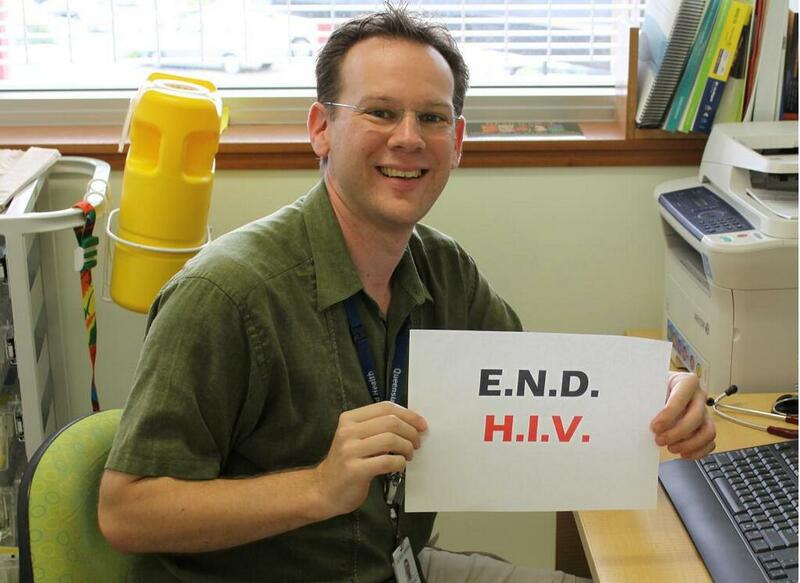 ‘Real science from real scientists, communicators, writers, artists, clinicians.’ OK so this year hasn’t seen so much of the latter, until this week where RealScientists featured our first clinician curator, infectious diseases specialist Dr Trent Yarwood of tropical far north Queensland. Trent’s curation coincided (although that suggests it wasn’t planned on our part!) with Antibiotic Awareness Week, tying in with his clinical role as leader of his hospital’s antibiotics stewardship programme. 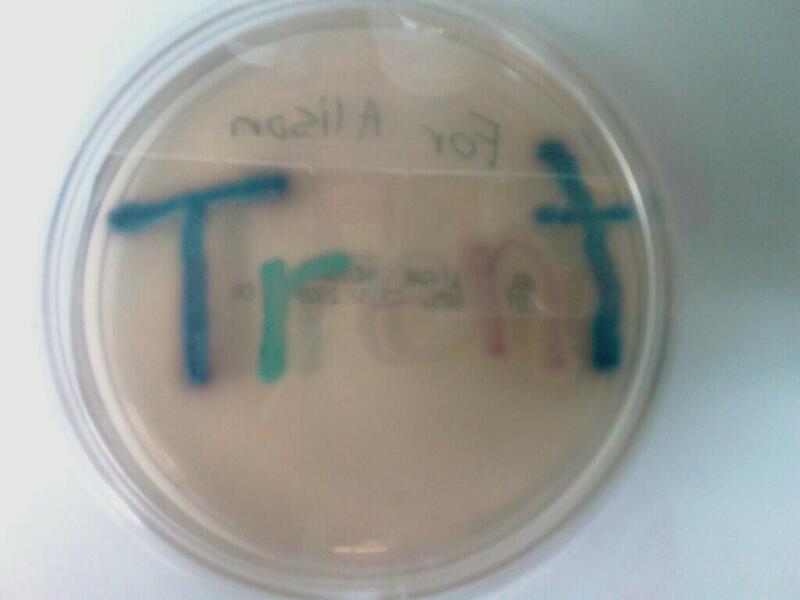 As Trent discussed during his week, these are dark times for antibiotics and the people who love them. Bacterial resistance to antibiotics is on the rise, aided by antibiotic overprescription and overuse in non-medical applications such as agriculture; rather than breeding contempt, familiarity breeds resistance, through selective pressure on bacteria to evolve a way around the challenge each antibiotic poses. 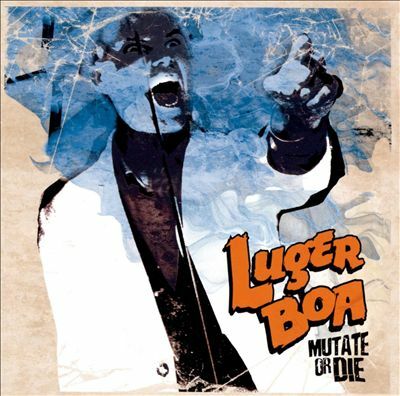 Mutate or die, as Luger Boa put it. Added to that, pharmaceutical companies have bailed out of developing new antibiotics, due to the poor return on investment that antibiotics provide – expensive to develop, rapid obsolescence due to resistance, and the likely markets are largely poor third world countries…. at the moment, anyway. It’s been left up to academic research labs to take up the challenge of developing new antibiotics – often by recycling, redesigning or repurposing old antibiotics for new niches or new targets. New antibiotic drug approvals. 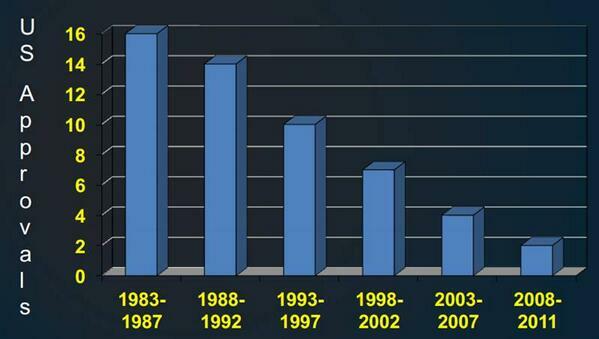 Yes, this graph has a dodgy Y axis, but you get the point. All this means it’s critical to make the best use of the antibiotics we have; don’t prescribe them inappropriately, and save the tactical weapons for when they’re really needed. Making what people like Trent do as important to the science of solving infectious diseases as anything done in a research lab. For that, and for a tremendous week on the account, we thank Trent. Keep following him on his personal account @trentyarwood, and if you missed anything this week catch up on Storify: Part 1 | Part 2. I work half-time as an infectious diseases physician in a public hospital. I finished my specialist training at the end of 2011, and graduated from UQ’s graduate medical course. My undergrad was in lab science – originally picked because I wanted a backup plan in case I didn’t get in to med school. I very much enjoyed lab science and while I was at uni vacillated between wanting to do medical research and pathology, but I had the chance to do an elective with the infectious diseases team and (although it sounds cheesy) realised that you could see patients and keep in touch with the micro lab by working as an ID doctor. It’s traditional in Brisbane for infectious disease doctors to also be trained as microbiologists – and despite my science training – the right fit for me was to do something a little bit different, so I’m currently doing further training half-time in public health medicine. I’ve always been more interested in preventive medicine rather than cure and I think public health is a natural extension of that. Combining clinical medicine with public health seems like a good fit to me – although I’ll probably tweet at some time during the week about some of the difficulty trying to cross two disciplines. My clinical work involves me being responsible for our hospital’s antibiotic stewardship program – which is a program to try and improve how antibiotics are used. This will hopefully mean better outcomes for patients, less antibiotic resistance as well as some cost saving. I plan on talking about antibiotic resistance a bit – especially given that I’m tweeting during antibiotic awareness week. I also do an HIV clinic a week; this helps keep me sane, as I’m spending a lot of my “clinical” time at the hospital doing paperwork and procedural stuff as our stewardship program is quite new. Outside of work I spend my time running after my two boys (4 and 7 months) and sleeping. I’ve been finding it quite tough to get any work done at home this year because after the bedtime routine is done, I often just fall asleep. If I manage to keep myself awake, I’m a bit of a stereotyped geek; I read science-fiction and play video games. 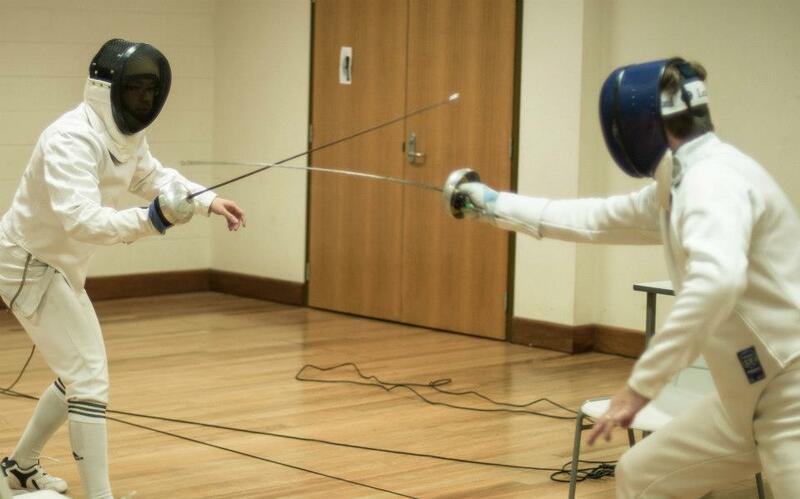 My sporting outlet is at the local university fencing club (just to carry on the stereotype) – which I’ve been doing intermittently since I was an undergraduate. Thanks very much for having me, and I look forward to chatting with everyone about antibiotics and whatever else comes up! Hopefully no nasty rashes come up. If so, Trent requests you go and see a doctor. Don’t just tweet at one on the internet. That said, interdisciplinary research is where it’s at right now. And right at the intersection of physics and biology you will find our curator for the last seven days, Dr Lindsay Waldrop of UNC Chapel Hill. Lindsay is a mathematician and physicist who works on complex problems in biology – at the moment, on modelling fluid flow in the vertebrate heart using the chordate sea squirt as an analogue (or as they would spell it in those parts, analog). This, to our completely unbiased worldview, is the coolest thing out of Chapel Hill since Michael Jordan was playing college ball for the Tar Heels. In between fighting with photocopiers, cleaning fish tanks and marking midterm exam papers, Lindsay spent her week talking comparative biomechanics, crab sniffing, math phobia and how to overcome it, tunicate and crustacean biology, the beauty of basic research. the pros and cons of working with non-Newtonian fluids (in particular the etiquette of ordering caseloads of Pantene Pro-V from your local Walmart) and how evolution is less intelligent design, more Macgyver with a roll of gaffa tape and a bunch of cable ties. Thanks very much to Lindsay for her brilliant work on the account this week – keep following her at @invertenerd, and if you missed anything this week make sure to catch up via Storify. Next week: Trent Yarwood, who went up a hill as a final-year medical doctor and came down a mountain as a public health specialist with a particular focus on antibiotics. 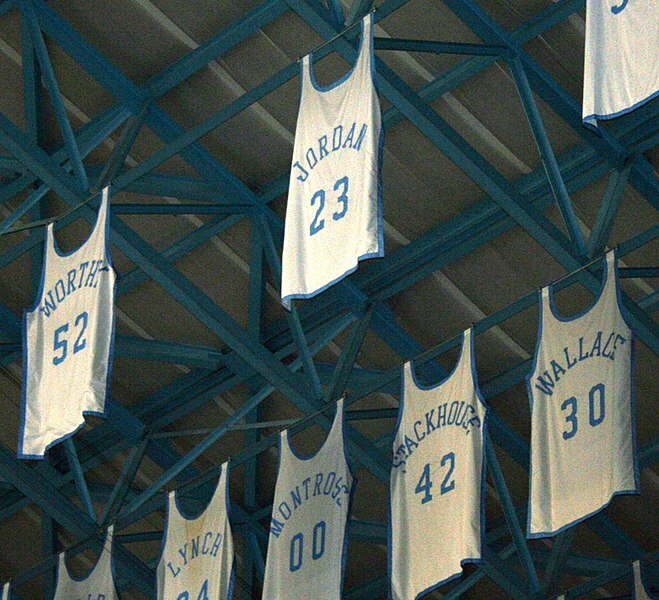 Our next curator for Real Scientists hails from the University of North Carolina at Chapel Hill, North Carolina. 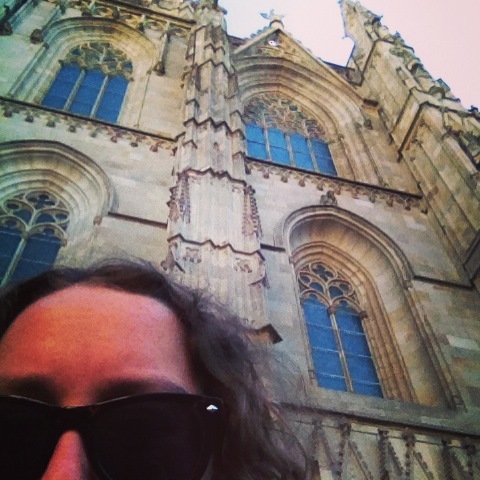 Dr Lindsay Waldrop (@inverternerd) is a postdoctoral fellow in Mathematics whose work focuses on how tiny animals and their structures interact with fluid environments. Lindsay was born in Minnesota and grew up in rural North Carolina. She did her undergrad work in biology and physics at UNC-CH (same place) and went to graduate school at the University of California, Berkeley in Integrative Biology. For her dissertation, she studied how crabs sniff (or in more fancy terms, discrete odor sampling by crustaceans using antennules). 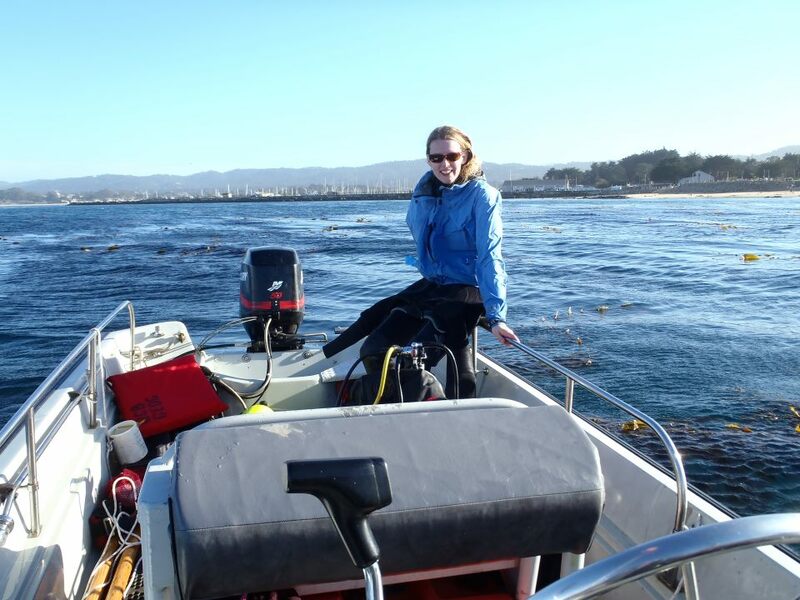 Currently, Lindsay’s work focuses on the tubular hearts of sea squirts (tunicates) and how we can use tunicates as a model system for studying fluid flow and transport by the human lymph system and development of the vertebrate heart. This work has applications in the development of fluid devices. Naturally, this sort of work has taken Lindsay to some fun places for field work: Monterey Bay, CA and Moorea, French Polynesia, and soon the Galapagos. We asked Lindsay a few questions.. I ask entirely too many questions, which made me pretty insufferable as a kid. I never got out of the habit, so science seems like a pretty good fit for my personality. I ended up taking a few courses in college and having friends who went into science also that helped push me into that direction. 2. Wait..How did you end up in mathematics after a degree in biology? My original interests are in both biology and and physics. And all of the biology questions that I study are basically ones of physical interactions, so I need a lot of training in math in order to answer them. I ended up in a math department because the type of modeling that my postdoc adviser does is probably one of the best way to investigate fluid-structure interactions. Also, being in a math department is a great opportunity to meet collaborators and learn how to work with mathematicians. 3. What unique perspectives does a multidisciplinary approach bring? Math is different than biology in a lot of important ways. Culturally, it is different. The research goals of mathematics is also different. Mathematicians aren’t necessarily concerned with answering questions about why things in nature are the way they are (like biologists or physicists), but developing better and more accurate methods for solving equations or proving theorems or learning how to apply new methods to very simplified physical situations that aren’t directly useful to biology. Learning how to apply these powerful methods in a way that is useful to biology requires understanding not just what is important to myself and other biologists but also how these applications and the research can benefit and be interesting to mathematicians. I love SCUBA diving with my husband because eveeything that really excites me about biology lives down there. That we can visit it occasionally is pretty nice. I also love making things with my husband who is a metal artist. He taught me how to weld on one of our first dates! We are currently developing a marine-biology themed sculpture for our yard. 5. What research would you do if money was no object? I would go to a lot of different places and collect ecological information about a lot of different animals to try and understand more about diversity of form and how it relates to environmental conditions. Very expensive to do, but could answer some interesting questions. Please give Dr Waldrop a huge Real Scientists welcome! 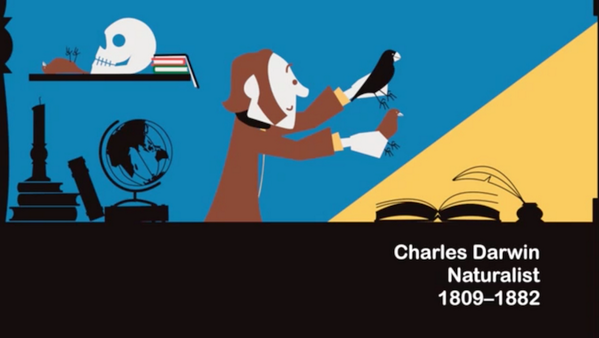 Get Animated: Welcome James Hutson to Real Scientists! From London back to Melbourne, we thank The Conversation UK’s Science and Tech editor Akshat Rathi for his week curating as Real Scientists. And now it is our great pleasure to welcome our next curator, James Hutson (@jameshutson)! 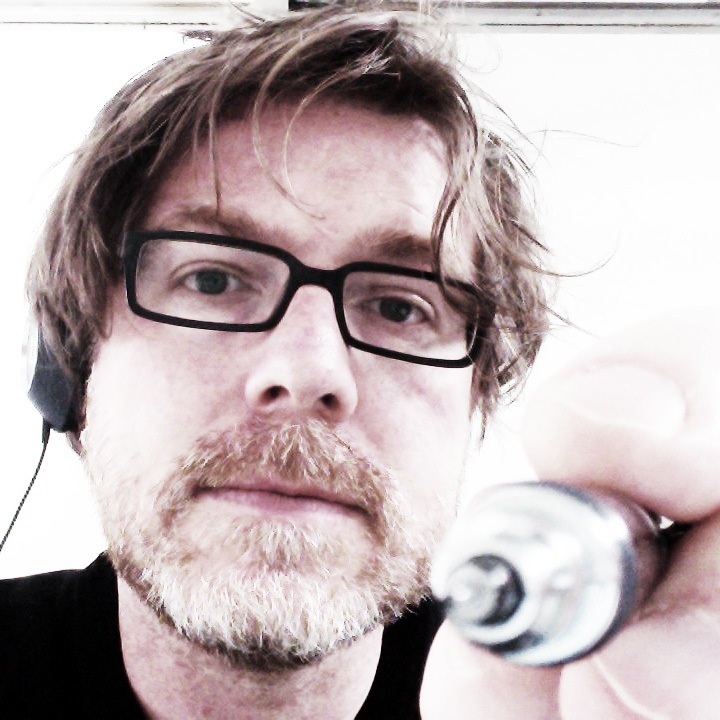 James Hutson is a writer, illustrator& animator. James is Creative Media Director of foresight agency Bridge8. James describes his work as “engaging various audiences in thinking about how science informs the future by translating, visualising and humanising complex source and stimulus materials.” James started out life training in science and lawyering, and ended up in science communication at the pointy end of TV. It’s another fascinating tale of how a science degree can take you to unusual places. In the last few years he’s animated, directed and written 23 animated shorts dealing with nanotechnology, genetic modification, vertical farming, artificial meat, synthetic biology and critical thinking. Some of the animations made and produced by James include: This Thing Called Science, a six part series introducing the basic elements of the scientific process, won best animation at SCINEMA 2013 and Gee Mmm Oh, which discusses genetic modification in rhyme, was selected by Science Studio for its inaugural collection of the year’s best of science multimedia. James lives in Melbourne with his wife kids and their dog. We did our usual thing of asking James a few nosy questions. 1. How did you get from science to animation? I studied science and law in Canberra. Back then a double degree just meant you got a lesser experience of both. My eclectic science degree is in part a reaction to that. What I couldn’t get in depth, I opted to get in breadth. I leapt from computer science major to molecular biology and along the way managed to talk my way into fish biology and evolution units. Thoroughly engaging experience and, entirely unbeknownst to me then, perfect for a science media career. It’s worth noting that if you were to look at my class notes during this time, you’d see off-topic sketches in every margin. And a few more on the bar tables, in the university newspaper, on the odd poster, political postcards, a lot of friend’s birthday cards and in our legal workshop yearbook. A sketcher with a sketchy science degree… oh and a LLB. So a little lawyering and wandering in the wilderness (Europe) later I returned to Australia and talked myself into a researcher and associate producer role with Beyond Productions in Sydney. Back then they made Beyond 2000 which was touted as the most widely-travelled, widely-seen science and technology program in the world. Today they are better known for Mythbusters. As Beyond 2000‘s TV audience ebbed we took it to the web to keep the brand alive. I was not only writing pop science stories, but more interestingly having to illustrate the vast number of stories that had very catchy content but lacked all useful visuals. I was (in part) getting paid to make pictures. Science and illustration with a wage was a revelation. And little later I moved to Melbourne where I studied animation and interactive media and have worked in educational and science-related media production ever since. A career is easy to see in retrospect, as my father-in-law used to say. 2. So the halfway point was TV? How was that? What did you work on? I spent much of my time in the SBS HR department as employment contracts lawyer talking my way into a job in TV production. I met an old friend of the original production manger of Beyond2000 who was very conveniently by then Head of Production for Beyond Productions. With a head full of Kevin Kelly’s Out of Control which I’d read and reread while in Europe, I had enough visual and technological story ideas to make an impression. My lack of enthusiasm for fast cars obviously counted against me but I also happened to be reading exactly the same book as him and, rather unscientifically, he took this to be a good sign. TV, particularly in the first year, was an astounding brain food smorgasbord. The production was rather lean so I go to do everything: research, story pitching, interviewing techniques, screen writing, voice over, camera work, producing local shoots, editing. And often (but not always) learnt from the best TV professionals in the world. I’ll share one of my favourite Beyond mantras: I.B.F. As in “well I’ll be f*cked”. A very Australian and very TV way of asking “where is the moment of astonishment in this science story?.” If isn’t in there, find it. If that story doesn’t have it, find another story. Be hard-headed about your awe and wonderment. I worked on three seasons of Beyond 2000 and the pitch that became Beyond Tomorrow (in the early 00s on Channel 7 in Australia). I toured US & UK making a one hour prion/BSE documentary which was tastefully titled Brain Snatchers (I preferred Apocalypse Cow). Researched for but wasn’t on the boat for the QUEST. Helped tell the story of farming settlement and metalwork in Stories from the Stone Age. Wrote or contributed to a host of pitches and snagged a original concept credit for Stings, Fangs & Spines (a 5 part series for the Discovery Channel). Was a feature extra ghost, high energy physicist and gila monster bit victim. I even wrote a segment for Golf Australia. 3. Now at Bridge8 working with a futurist. How did you meet Kristin Alford? Given my Beyond 2000 background, this makes perfect sense to me. We also work in different cities. How futuristic is that?! I met Bridge8 founder, Kristin Alford, at an Australian Science Communicators‘s conference. She thought that my visualisation skills might proved useful for a review she was conducting of her business. 3 years, 23 animated shorts and a host of other projects later, I’m still here. Our approaches and experience are a little chalk and cheese. She’s very systematic and I can be a little order from chaos especially in the more creative work. We’re still looking for the ideal project to combine our skills but in the meantime we manage to find collaborative opportunities in an array of intriguing work. Online community building like the Australia edition of I’m a Scientist, Get Me Out of Here and the twitter chat #onsci have been especially rewarding. Through them I’ve had the opportunity to get to know some excellent people, who just happen to be some of Australian’s up and coming scientists and science communicators. 4. What would you love to do if cost was no bar? What kind of projects? I used to joke that my background made me an ideal choice to make an animated documentary series about bioinformatics patent infringements. Except that wasn’t really a joke. Big complex, largely unseen, multidisciplinary issues like that which impact on our daily lives provide really rich story and visual opportunities. Better yet. I’d like to try a regular series. 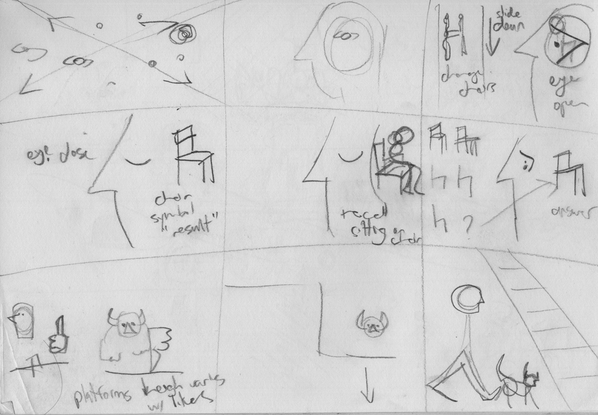 Like a slightly less serious and animated version of RadioLab or 99% Invisible. Sponsors, supporters, fans: call me. We can make this happen. My hobbies (drawing, writing, reading) became my work. A dangerous path. Perhaps I need new hobbies. Hmmm. Furniture making temps me. I certainly need more bookshelves. I’m trying once again to reboot my piano playing (dormant for many years). I really should do some more life drawing- though nowadays that counts as a tax deduction. And a sea kayak might be useful. Please welcome James Huston to Real Scientists!